The Russian Navy is expected to receive the first-of-class Project 22350 frigate on July 28. 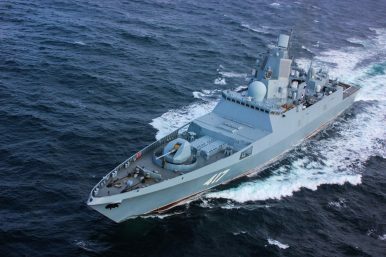 Following a multi-year delay, the Admiral Gorshkov, lead ship of the Admiral Gorshkov-class (Project 22350) of guided missile frigates, is expected to be delivered to the Russian Navy on July 28, a day before the service’s traditional grand naval parade in St. Peterburg, according to the President of Russia’s United Shipbuilding Corporation Alexei Rakhmanov. “Yes, the fleet has such thoughts,” Rakhmanov is quoted as saying by TASS news agency on July 18 in response to a reporter’s question whether the Russian Navy ensign, the St. Andrew’s Flag, will be hoisted aboard the Admiral Gorshkov ahead of Russia’s Navy day, which traditionally is celebrated on the last Sunday of July. The Admiral Gorshkov, with a total displacement of around 4,500 tons — the largest surface combatant built by Russia since the collapse of the Soviet Union — is currently undergoing hull and superstructure coating ahead of the expected flag raising ceremony and the subsequent naval parade. The Russian Navy has so far not publicly confirmed the July 28 delivery date. The Admiral Gorshkov-class has had to deal with various technical issues, including performance and compatibility problems with its Polimut Redut air defense missile system and with its propulsion system. The entire Project 22350 program also suffered from periodic funding shortages since its inception. Displacing around 4,500 (standard) tons, the Admiral Gorshkov-class is the largest class of surface warships to be built by Russia since the collapse of the Soviet Union. It is a multi-purpose platform designed for anti-air, anti-surface, and anti-submarine warfare missions. Delivery of the second Admiral Gorshkov-class (Project 22350) guided missile frigate Admiral Kasatonov will also be delayed by around eight months. Delivery of the ship is now expected in October or November 2019. Two additional Project 22350 frigates are currently under construction. However, it is unclear whether Russia’s shipbuilding industry will be able to design and build a new propulsion system for the ships as the existing stock of Ukraine-made gas turbine engines has been depleted and no new imports from Ukraine, given the ongoing conflict, can be expected. The Russian Navy has commissioned its first Project 22350 guided missile frigate into service on July 28.